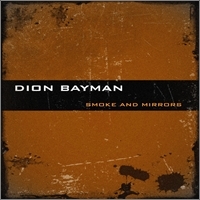 RockUnitedReviews: DION BAYMAN: "Smoke and Mirrors"
Here's a nice surprise from down under, Oz, Australia. No, it doesn't rawk like acca dacca and I'm yet to find a single kangaroo on the artwork... or rather lack of art (see the plain cover). Dion Bayman is however the multi-talanted musician with a soft spot for soft rock and hooky melodies. I've been told that it's music in the vein of Richard Marx and Bryan Adams. Sure, the first is sort of correct, but I can't find any trace of Adams to be honest. If anything Dion follow in the footstep of another great Aussie soft rocker that knocked us to the ground in the past. I'm obviously (?) talking about RICK PRICE and his excellent debut album "Heaven Knows" which provided us hits such as 'Not A Day Goes By' and the fine remake of 'Walk Away Renee'. Throw in the odd Tal Bachman and Matchbox Twenty and you're pretty set for a cruising good time. It's a feel good album with plenty of emotion and the songs are well-crafted westcoast/ modern pop/rock AOR? Ehhh... nevermind. Let's just call it soft-rock, yeah? I know that some reviewer (he posted a shameless link at mr.com) thought that and I quote, "Dion's lyrics are a real strong point of the album, deep, thoughtful and emotional", end quote. But that's probably his weakest link since they are utterly safe, at times boring, cliché-like love stories that we've heard a million times before. They hardly scratch the surface and it just sounds sterile and daytime TV soap-ish. It may sound a bit harsh... but try and look past your own little world at times and notice all the problems in the world? Why not include a bit of everything instead of just the fluffy stuff? Why can't I just be pleased with the catchy melodies? Good point. Let's move on. Bottomline: Don't knock it before you've tried it! Have a go at this album if you're into Richard Marx, Rick Price, etc.